Draft: 2001, Detroit Tigers, 5th rd. Ryan Neil Raburn...Did not sign after being selected in the 18th round of the 1999 First-Year Player Draft by the Tampa Bay Devil Rays out of Durant High School in Plant City, FL...Attended college at South Florida Community College, University of South Florida and the University of Florida...His brother, Johnny, enjoyed an 11-year Minor League career. Began the season in the Chicago White Sox chain before being acquired via Minor League trade on May 26...Was hitting .277 (23-for-83) with one double, one triple, one homer 13 RBI, 20 walks and 11 runs scored in 27 games for Triple-A Charlotte before being acquired by Washington on May 26... Was a non-roster invite to 2017 Spring Training with the Cincinnati Reds...Joined the White Sox system on March 27...Had his contract selected from Triple-A Syracuse on June 5...Hit .288 (15-for-52) with a double, two triples, two homers, and five RBI in 14 starts...Laced his fourth career walk-off hit on July 3 vs. NYM (Salas)...Clubbed his first homer as a National, June 21 at MIA (Straily)...Was placed on the DL on July 26 (L. Trapezius Strain). During spring training was signed by the Rockies to a minor league contract and appeared in 113 games, his highest total since 2011...produced 4 pinch-hit home runs, second-most in Rockies history behind Mark Sweeney's club record 5 pinch-hit HR in 2004 and tied with 3 other players for the most in the Major Leagues (StL's Jeremy Hazelbaker, Pit's Matt Joyce, Atl/NYM's Kelly Johnson)...made 44 starts in LF, 1 start in RF, 3 starts at 1B and 6 starts at designated hitter...in the ninth inning of Col's 11-2 win on 7/15 at Atl hit his first career pinch-hit grand slam (off Dario Alavrez)...on 4/27 vs Pit recorded a season-high 3 hits and for the first time in his career produced a double and triple in the same game...following the season became a free agent and on 2/19/17 was signed by the Reds to a minor league contract with an invitation to Major League spring training camp. Made 176 of his 201 plate apps vs LHP and hit .325, 10th-best in the American League vs LHP and fifth-best in the AL vs LHP in slugging percentage (.589)...in a 17-0 loss on 6/17 vs Cubs made his second career appearance as a pitcher (0.2ip, 1h, 2r, 0er, 1bb, 0k)...eventually was replaced on the mound with elbow soreness that sidelined him for a few days. Sp ent the year in Cleveland and was never right physically with a variety of ailments, those of which started all the way back on March 7 in Spring Training when he ran into the outfield wall in Mesa against the Cubs, missing 11 days with knee and wrist injuries that p lagued him most of the season ...E ventually went on the 15-day Disabled List from August 18-Sep t. 1 with right wrist soreness and sp ent seven games in AAA Columbus and AA Akron on a rehab assignment at the end of August. On the year he made 19 starts at designated hitter, 19 starts in right field (25 games), 14 starts in left field (20 games and appeared in 1 game at first base...Hit .195 (24-123, .596OPS, 4HR, 14RBI) off left-handed pitching in 2014 after hitting .308 (33-107, 7HR, 21RBI, 1.020O P S) off lefties in 2013 ... Longest hitting streak was 5 games and longest on-base streak was 6 games...Did not hit his first home run until May 22...Was 3-for-17 as a pinch-hitter with 4 RBI ... From April 13 thru the end of the season he hit .185 (30-162) w/6 2B, 4HR, 18RBI in 64 games after going 9-for-33 (.273) w/a 2B, 4RBI over his first 10 games of the season. Season ended p rematurely on Sep tember 13 at Detroit when he hyp er-ex tended his left knee making a throw from right field in Detroit ...Missed the final 14 games of the season from Sept 14-28...Underwent arthroscopic surgery on Sept. 19 at the Cleveland Clinic (Dr. Rick Parker) to rep air a lateral meniscus tear...F ull recovery for an arthroscopic partial meniscectomy for a lateral meniscus tear is 6-to-8 weeks. ?igned to a Minor League deal in January with a big league non-roster invite, Ryan proved to a be a key player over the club's resurgent season, earning himself regular playing time with consistent productivity when healthy and signed a two-year extension thru the 2015 season on August 6...His 16 home runs were 4th on the club in just 277 plate appearances, the most homers of any hitter in the big leagues with fewer than 300 plate appearances...His RBI ratio of 4.4 would have ranked 3rd-best in the American League with enough qualifying at bats, behind only Miguel Cabrera and Chris Davis...Indians were 9-4 (.692) in games he homered... Also owns a .828 career OPS vs. lefthanded pitching...Is a career .299 (88-294) hitter vs. the Chicago White Sox with 18 2B, 17HR & 68RBI in 94 games (next highest RBI total vs. a single team in 23 vs KC). ?tarted April 9-for-42 (.214) thru games of April 28 before busting loose at the end of April, a tear that began on April 29 at Kansas City (4-for-4, 2HR, 4RBI), his 5th career two-homer game and the first of three 2-homer games for Ryan in 2013 (now has 7 career)...Also hit 2HR the next day (April 30 vs. PHI, 3-4, 2HR, 3RBI, 3RS) and on August 1 vs. Chicago-AL... With the back-toback multi-HR games became the 11th Indian to do so and the first since Travis Hafner in 2004. ?njoyed a 4-hit game on May 1 vs. Philadelphia (4-5, 2B, 2RBI) to become just the fourth player in the last 75 years to record at least 11 hits, 4HR in a 3-game span…Others were Duke Snider (1955 Dodgers), Kirby Puckett (1987 Twins), Shawn Green (2002 LAD)...First MLB hitters since August 2009 with 11 hits in 12 at bats and was named AL Player of the Week for the first time in his career, April 29-May 5 (.591, 13-for-22, 4HR, 9RBI). ?rove in a season-high 5 runs on September 13 at Chicago-AL...Was limited to just 3 games from August 14-Sept. 7 due to right calf soreness and left heel/Achilles soreness that forced him onto the 15-day Disabled List from August 19-Sept 2....From August 14 thru the end of the season he appeared in only 17 games...Recorded an OPS of 1.020 off left-handed pitching during the season (12 2B, 7HR, 21RBI), the 5th-best mark in the AL behind Miguel Cabrera's 1.210 mark among players with at least 100PA vs. LHP. ?rom June 28 thru the end of the season he hit .289 (33-114) with 9 2B, 8HR & 34 RBI in 40 games (.948OPS)...From August 13 thru the end of the season Ryan batted .278 (15-54) with 4 2B, 3HR & 17 RBI in his final 18 games....Was among the most clutch hitters on the team, hitting .378 (14-37) with RISP-2outs... Batted .298 (36-121) with runners on base... Tossed a scoreless inning in his first professional pitching appearance in the 9th inning of a 10-3 loss to Detroit (1.0IP, 0H, 0R, 0BB, 1K/Matt Tuiasosopo). Is a career .298 (28-94) hitter in Progressive Field in 30 games (3HR, 11RBI)...Also owns a .796 career OPS vs. left-handed pitching...Is a career .290 (72-248) hitter vs. the Chicago White Sox with 13 2B, 13HR & 50RBI in 79 games.... Spent 2012 season between Detroit Tigers Major League roster, two stints to the DL and a pair of trips (one rehab) to AAA Toledo...Was optioned to AAA Toledo by the Tigers on May 29...Recalled by the Tigers on June 14 and batted .323 (10-31) with four doubles and three RBI over an 11-game stretch June 14-July 1. Sidelined August 1-September 1 with a right thumb sprain and was assigned to Toledo on an injury rehabilitation assignment on August 22 where he hit .310 (9-29, 9RBI, 7G)...Landed on the disabled list for the remainder of the season on September 11 with a right quadriceps strain...Non-tendered by Detroit on November 20 and was rendered a free agent. Appeared in a career-high 121 games during the 2011 season as he saw action at first base, second base, third base,left field, center field and right field for the Tigers...Collected a season-high four RBI on April 22 versus the Chicago White Sox -- matched the high with four RBI on June 5 at Chicago's U.S. Cellular Field against the White Sox...Belted the third grand slam of his career on June 5 at Chicago's U.S. Cellular Field against the White Sox...Hit .324 (12x37) over an 11-game stretch July 4-25...Batted .323 (20x62) with three doubles, a triple, two home runs and eight RBI in 19 games during August...Equaled a career high with four hits on September 12 at Chicago's U.S. Cellular Field against the White Sox...Batted .471 (16x34) with four doubles, a triple, two home runs and seven RBI over his final 11 games of the season September 12-27...Hit .383 (18x47) with four doubles, a triple, three home runs and nine RBI in 17 games during September -- fourth in the American League with a .383 batting average during the month...Hit .274 (40x146) versus lefthanded pitchers...batted .245 (59x241) with righties on the mound...Batted .341 (44x129) in 45 games following the all-star break...hit .213 (55x258) in 76 games prior to the all-star break. Established career highs with 54 runs scored, 104 hits, 25 doubles and 62 RBI as he spent the majority of the 2010season with the Tigers....Optioned to Triple A Toledo by the Tigers on May 12 -- saw action in seven games with the Mud Hens before he wasrecalled by the Tigers for the remainder of the season on May 22....Hit .342 (68x199) with 37 runs scored, 14 doubles, 13 home runs and 39 RBI over his final 53 games of the seasonAugust 5-October 4 -- second among all American League players with a .342 batting average and .608 sluggingpercentage during that stretch, while he tied for second with 27 extra-base hits, finished third with 37 runs scored, tiedfor third with 13 home runs, finished fourth with 39 RBI, tied for fourth with 68 hits and tied for fifth with 14 doubles....Belted a game-tying, three-run home run with two outs in the bottom of the ninth inning on August 5 versus the Chicago White Sox -- according to the Elias Sports Bureau, it marked the first game-tying or go-ahead home run by a Tigersplayer with the club down to its last out and trailing by at least three runs in the ninth inning-or-later since May 28, 1998when Andy Tomberlin capped a five-run rally in the bottom of the ninth inning versus the White Sox at Tiger Stadiumwith a game-tying three-run home run....Established a career high with a 10-game hitting streak August 18-29, batting .357 (15x42) with five doubles, threehome runs and 10 RBI....Equaled a career best with two home runs on August 29 at Toronto....Tabbed the Tigers Player of the Month for August after hitting .308 (32x104) with 21 runs scored, seven doubles, eighthome runs and 21 RBI in 28 games -- tied for fourth in the American League with eight home runs during the month,while he tied for sixth with 21 RBI....Selected the Tigers Player of the Month for September after batting .378 (34x90) with seven doubles, five home runsand 17 RBI in 25 games -- second in the American League with a .378 batting average during the month, while he tiedfor ninth with 34 hits....Batted .208 (25x120) with two home runs in 43 games prior to the all-star break...hit .315 (79x251) with 13 home runsin 70 games following the all-star break. Established career highs in nearly every offensive category, including hits (76), home runs (16) and RBI (45) as hespent the majority of the 2009 season with the Tigers...Opened the season with Triple A Toledo -- connected for two home runs with the Mud Hens on April 14 at Louisville...Recalled by the Tigers from Toledo on April 22 -- was leading the International League with five home runs at the timeof his recall by the Tigers...Hit .414 (12x29) with two doubles, three home runs and 11 RBI over a 12-game stretch May 13-June 4...Belted his second career grand slam on May 15 versus Oakland -- drove in a season-high five runs...Homered in three straight games May 15-20...Saw action at first base on May 25 at Kansas City after entering the game as a pinch-runner -- marked his firstprofessional action at the position...Batted .300 (12x40) with a double, three home runs and 12 RBI in 16 games during May...Belted a pinch-hit, walk-off home run on June 23 versus the Chicago Cubs -- marked the first pinch-hit, walk-off homerun by a Tigers player since Lou Whitaker connected for a three-run home run off Chicago's Roberto Hernandez in a7-5 victory over the White Sox on August 23, 1995 at Tiger Stadium...Collected a season-high three hits on June 25 versus the Chicago Cubs -- equaled the high with three hits on June 30at Oakland, July 29 at Texas, August 1 at Cleveland, August 20 versus Seattle, September 8 at Kansas City andOctober 4 versus the Chicago White Sox...Equaled a career high with two home runs on August 21 at Oakland -- matched the career high with two home runs onOctober 4 versus the Chicago White Sox...Batted .327 (16x49) with four home runs in 27 games during August...Belted his second career lead-off home run on September 14 versus Toronto, connecting off David Purcey...Hit .321 (17x53) with two doubles, four home runs and eight RBI in 24 games during September...Batted .305 (39x128) with four home runs versus righthanded pitchers...hit .278 (37x133) with 12 home runs againstlefthanded pitchers...Hit .258 (34x132) in 57 games at home...batted .326 (42x129) in 56 games on the road...Batted .269 (32x119) in 50 games prior to the all-star break...hit .310 (44x142) in 63 games following the all-star break. Made the Tigers Opening Day roster out of Spring Traning in 2008, marking the first time he has appeared on an Opening Day roster at the major league level...Displayed his versatility for the Tigers, seeing action at five positions for the the club: second base (16 games), thirdbase (18 games), left field (30 games), center field (six games) and right field (22 games)...Appeared in one game as a pinch-runner for Detroit before being optioned to Triple A Toledo on April 5...Hit safely in four of his five games with the Mud Hens before he was recalled by the Tigers for the remainder of theseason on April 13...Connected for his first career pinch-hit home run on June 17 at San Francisco...Belted his first career grand slam on June 28 versus Colorado, connecting off Jeff Francis in the fourth inning...Batted .320 (8x25) with two doubles, a home run and four RBI in 14 games during July...Equaled a career high with four hits on August 5 at Chicago's U.S. Cellular Field against the White Sox. Opened the season with Triple A Toledo and he spentthe first three months of the season with the Mud Hensbefore earning a promotion to Detroit...Selected to the International League's mid-season allstarsquad -- unable to participate in the Triple A All-StarGame due to his promotion to Detroit...Rated as possessing the best outfield arm in theInternational League by Baseball America...Tied for third in the International League with 15 RBIduring April, while he tied for fifth with four home runs...Hit for the cycle on May 27 versus Columbus -- firstMud Hens player to accomplish the feat since DewayneWise on May 14, 2005 at Pawtucket...Tied for third in the International League with six homeruns during May, while he finished fifth with 22 RBI -- hit.290 (29x100) with 24 runs scored, six doubles and twotriples in 29 games during the month...Posted a 10-game hitting streak June 18-28, batting.357 (15x42) with eight runs scored, five doubles, a homerun and five RBI...Selected the TOPPS Player of the Month in theInternational League in June after hitting .348 (39x112)with 22 runs scored, nine doubles, a triple, six home runsand 24 RBI in 28 games -- led the league with 68 totalbases during the month, while he finished fourth with 24RBI, tied for fourth with six home runs and sixth with a.348 batting average...Joined the Tigers after having his contract purchasedfrom Toledo on July 6 -- at the time of his promotion, hewas leading the International League with 60 runs scored,while he was second with 64 RBI, tied for third with 41extra-base hits and a .540 slugging percentage and fourthwith 17 home runs...Belted his first major league home run on July 21 versusKansas City, a lead-off blast off Jorge De La Rosa...Established career highs with four hits, two home runsand seven RBI on July 25 at U.S. Cellular Field againstthe White Sox -- first Tigers player with seven RBI sinceCarlos Pena on May 19, 2003 at Cleveland...it marked the13th seven-or-more RBI game by a Tigers player since atleast 1957, including the only one by a club rookie duringthat stretch...his four hits were the most by a club rookiesince Curtis Granderson collected five hits on September18, 2005 at the Los Angeles Angels of Anaheim...his 11total bases were the most by a Tigers player in a singlegame since Ivan Rodriguez collected 11 total bases onApril 5, 2006 at Kansas City...Compiled a career-high six-game hitting streak July 29-August 7, batting .391 (9x23)...Hit .387 (12x31) in 12 games during July, collecting twodoubles, three home runs and 10 RBI...Collected a career-high two doubles on August 7 versusTampa Bay...Batted .338 (27x80) against righthanded pitchers forthe Tigers...hit .259 (15x58) with lefties on the mound...Hit .359 (14x39) with runners in scoring position. Spent his second season with Triple A Toledo, earning International League all-star honors as he split time between second base and the outfield...Posted a 13-game hitting streak May 7-20, batting .436 (24x55) with 11 runs scored, five doubles, a triple, four home runs and 12 RBI...Belted a season-high two home runs on May 18 at Norfolk...Named the Tigers Minor League Player of the Month seven doubles, a triple, five home runs and 20 RBI -- tied for third in the league with 20 RBI during the month, while he was fifth with 56 total bases...Hit .314 (33x105) with 16 runs scored, nine doubles, a triple, five home runs and 15 RBI in 27 games during June -- fourth in the league with 59 total bases during the month...Sidelined August 11-26 with a left rib cage contusion...Saw action in nine games during the International League playoffs, batting .114 (4x35) with four runs scored, a home run and two RBI...Named the 27th-best prospect in the Tigers organization following the season by Baseball America. Spent the entire 2005 season at Triple-A Toledo, where he hit .253 with 19 home runs and 64 RBIs in 130 games. He went 3-for-4 with two doubles and four RBIs for the Mud Hens on August 22 at Charlotte. Played the majority of his first season as a second baseman at Double A Erie, before seeing his first major league action with the Tigers in September...Opened the season on the disabled list at Erie with a dislocated right finger... His option was transferred to Single A Lakeland on May 14 after being reinstated from the disabled list -- played in three games with Lakeland before having his option transferred back to Erie on May 18...Sixth in the Eastern League with a .390 on-base percentage for the SeaWolves, while he finished ninth with a .533 slugging percentage and tied for ninth with a .301 batting average...Collected a season-high two home runs and four RBI May 26 versus Akron -- equaled the high in home runs on August 4 at Portland and matched the best in RBI on July7 versus Binghamton, August 4 at Portland and August 10 versus Reading...Posted two four-hit games for the SeaWolves, June 20 at Altoona and August 10 at Reading...In 28 games during June, he batted .208 (20x96) with 13 runs scored, three doubles, two home runs and seven RBI -- tied for the league lead during the month with 20 walks... Over his final 56 games July 4-September 6, he hit .367 (81x221) with 48 runs scored, 25 doubles, four triples, 12 home runs and 52 RBI...Recorded a 13-game hitting streak July 4-19, batting .442 (23x52) with five runs scored, seven doubles, a triple, three home runs and 13 RBI...Tied for fourth in the league with nine doubles during July and tied for sixth with 21 RBI -- batted .348 (32x92) in 24 games during the month, scoring 11 runs and belting four home runs...Reached base safely via a hit or walk in his final 25 games of the season August 9-September 6, hitting .420 (42x100) with 30 runs scored, 13 doubles, two triples, four home runs, 22 RBI and a .482 on-base percentage...Recorded the league's longest hitting streak, a 20-game streak August 9-31...batted .476 (39x82) over the course of the streak, scoring 26 runs and collecting 12 doubles, two triples, four home runs and 22 RBI...Selected as the Eastern League's Player of the Week for August 9-15 after batting .520 (13x25) with 10 runs scored, five doubles, two home runs and nine RBI in six games...Named the Tigers Minor League Player of the Month for August after hitting .407 (48x118) with 33 runs scored, 15 doubles, two triples, eight home runs and 31 RBI in 29 games -- led the league during the month with a .407 battingaverage, 33 runs scored, 48 hits and 15 doubles,while he finished second with 31 RBI and tied for fifth with eight home runs...Led all Eastern League second basemen with 26 errors...Hit .310 (31x100) against lefthanded pitchers in theEastern League and .297 (79x266) with righties on the mound...Saw action in three games during the Eastern League playoffs for the SeaWolves, hitting .286 (4x14) with a run scored and double...Recalled from Erie by the Tigers on September 12 -- made his major league debut that day versus Minnesota, striking out as a pinch-hitter in the ninth inning...Ripped a run-scoring double, his first major league hit,in the fifth inning off C.C. Sabathia on September 16 at Cleveland...Collected a career-high two hits October 3 versus Tampa Bay...Named the eighth-best prospect in the Tigers organization following the season by Baseball America. Combined to hit .241 with 15 home runs and 68 RBIbetween Single A West Michigan and Single ALakeland...third among all Tigers minor leaguers in RBIand fourth in home runs...Opened the season with West Michigan, hitting safelyin 13 of his 16 games with the Whitecaps...Hit safely in eight of his final nine games with WestMichigan April 14-22, batting .400 (14x35) with 11 runsscored, six doubles, three home runs and 11 RBI...Tied for fifth in the Midwest League during April withthree home runs and he finished seventh with a .351 battingaverage (20x57)...Promoted to Lakeland late in April...fifth in the FloridaState League with one home run every 27.08 at-bats...Started slowly in Lakeland, managing three hits in hisfirst 28 at-bats (.107) over an eight-game stretch April25-May 2...Drove in a season-best four runs May 6 versus FortMyers...equaled the season high at Jupiter on May 21...Garnered Florida State League Player of the Weekhonors for May 19-26 after hitting .429 (9x21) with nineruns scored, two doubles, a home run and four RBI inseven games...In 28 games during May, he hit .268 (26x97) with 20runs scored, five doubles, one triple, four home runs and18 RBI...Collected a season-high five hits June 2 at Fort Myers,finishing with two doubles and three RBI...Hit safely in eight-of-nine games June 8-27, batting.294 (10x34) with five runs scored, two doubles, twohome runs and six RBI...Belted three home runs during June, tied for fifth-mostin the Florida State League...Batted .325 (13x40) over a 14-game stretch July 5-22,scoring eight runs and collecting two doubles, two triplesand 11 RBI...Followed that 14-game stretch with two hits in his next32 at-bats (.063) July 23-August 6...Finished July with a .225 batting average (16x71) in 24games...scored 10 runs during the month and tallied threedoubles, two home runs and 15 RBI...Hit safely in seven-of-eight games August 8-19, batting.321 (9x28) with eight runs scored, a double, three homeruns and eight RBI...Finished the season with just two hits in his final 30 atbats(.067) over an eight-game stretch August 22-31...In 19 games during August, Raburn hit .151 (11x73)with nine runs scored, a double, triple, three home runsand 11 RBI...his batting average during the month wassecond-lowest in the Florida State League...Fared better against lefthanders in the Florida StateLeague, hitting .324 (24x74)...batted .191 (48x251) forLakeland versus righties. 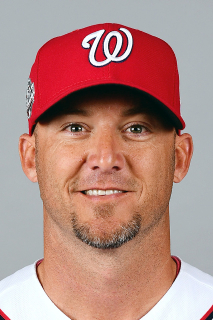 March 24, 2018 Washington Nationals released OF Ryan Raburn. February 13, 2018 OF Ryan Raburn assigned to Syracuse Chiefs. November 19, 2017 Washington Nationals signed free agent OF Ryan Raburn to a minor league contract and invited him to spring training. November 2, 2017 LF Ryan Raburn elected free agency. August 29, 2017 Washington Nationals transferred LF Ryan Raburn from the 10-day disabled list to the 60-day disabled list. Left trapezius strain. July 27, 2017 Washington Nationals placed LF Ryan Raburn on the 10-day disabled list retroactive to July 23, 2017. Left trapezius strain. July 23, 2017 Washington Nationals placed LF Ryan Raburn on the bereavement list. June 5, 2017 Washington Nationals selected the contract of LF Ryan Raburn from Syracuse Chiefs. May 27, 2017 LF Ryan Raburn assigned to Syracuse Chiefs. May 26, 2017 Chicago White Sox traded LF Ryan Raburn to Washington Nationals. April 8, 2017 Chicago White Sox signed free agent LF Ryan Raburn to a minor league contract. April 8, 2017 LF Ryan Raburn assigned to Charlotte Knights. February 19, 2017 Cincinnati Reds signed free agent LF Ryan Raburn to a minor league contract and invited him to spring training. November 3, 2016 LF Ryan Raburn elected free agency. March 29, 2016 Colorado Rockies selected the contract of LF Ryan Raburn from Albuquerque Isotopes. March 14, 2016 LF Ryan Raburn assigned to Albuquerque Isotopes. March 7, 2016 LF Ryan Raburn assigned to Colorado Rockies. March 4, 2016 Colorado Rockies signed free agent LF Ryan Raburn to a minor league contract and invited him to spring training. November 4, 2015 LF Ryan Raburn elected free agency. August 15, 2015 Cleveland Indians activated LF Ryan Raburn from the bereavement list. August 11, 2015 Cleveland Indians placed LF Ryan Raburn on the bereavement list. September 2, 2014 Cleveland Indians activated LF Ryan Raburn from the 15-day disabled list. August 31, 2014 Cleveland Indians sent RF Ryan Raburn on a rehab assignment to Columbus Clippers. August 27, 2014 Cleveland Indians sent RF Ryan Raburn on a rehab assignment to Akron RubberDucks. August 23, 2014 Cleveland Indians sent RF Ryan Raburn on a rehab assignment to Columbus Clippers. August 19, 2014 Cleveland Indians placed RF Ryan Raburn on the 15-day disabled list retroactive to August 18, 2014. Right wrist soreness. September 3, 2013 Cleveland Indians activated RF Ryan Raburn from the 15-day disabled list. August 28, 2013 Cleveland Indians placed RF Ryan Raburn on the 15-day disabled list retroactive to August 19, 2013. Left Achilles strain. March 31, 2013 Cleveland Indians selected the contract of RF Ryan Raburn from Columbus Clippers. January 21, 2013 Cleveland Indians signed free agent 2B Ryan Raburn to a minor league contract and invited him to spring training. November 20, 2012 Detroit Tigers released 2B Ryan Raburn. October 29, 2012 Detroit Tigers activated 2B Ryan Raburn from the 15-day disabled list. September 13, 2012 Detroit Tigers placed 2B Ryan Raburn on the 15-day disabled list retroactive to September 11, 2012. Right quadriceps strain. September 1, 2012 Detroit Tigers activated 2B Ryan Raburn from the 15-day disabled list. August 22, 2012 sent 2B Ryan Raburn on a rehab assignment to Toledo Mud Hens. August 5, 2012 Detroit Tigers placed 2B Ryan Raburn on the 15-day disabled list retroactive to August 1, 2012. Sprained right thumb. June 14, 2012 Detroit Tigers recalled Ryan Raburn from Toledo Mud Hens. May 30, 2012 Detroit Tigers optioned Ryan Raburn to Toledo Mud Hens. May 25, 2012 Ryan Raburn roster status changed by Detroit Tigers. May 22, 2012 Detroit Tigers placed LF Ryan Raburn on the bereavement list. May 22, 2010 Detroit Tigers recalled Ryan Raburn from Toledo Mud Hens. May 12, 2010 Detroit Tigers optioned Ryan Raburn to Toledo Mud Hens. April 22, 2009 Detroit Tigers recalled Ryan Raburn from Toledo Mud Hens.